IMAGINE being invited to have your artwork displayed at an exhibition at the Sydney Opera House. For accomplished Blayney artist Nyree Reynolds there's nothing imaginary about it - she has just exhibited five of her paintings at the national icon. Nyree travelled to Sydney last Friday to display her range of stolen generation themed artworks at the launch of Aboriginal artist Evette Morgan's Jabidi exhibition. "Evette approached me to show my paintings and I jumped at the chance because I wanted to try her new silk canvass," Nyree said. 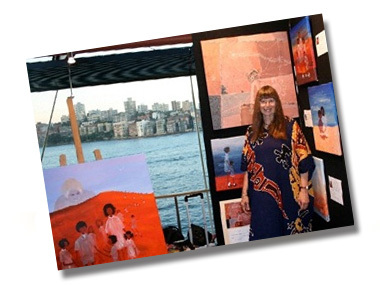 "It was incredible to have my paintings displayed in front of that beautiful harbour backdrop." Nyree said her exhibited artworks depict stolen generation children longing for home, and are loosely based on the music of Indigenous artist Archie Roach. The Sydney Opera House opportunity has capped off an exciting few months for the local artist, who has also been chosen to be apart of the Bathurst Art and Culture Trail projects. "The art trail involves a group of artists from around the Bathurst region getting together to open their studios to the public on the first weekend of every month. "I'm opening my studio in May and I hope it will help promote tourism and put Blayney on the arts map," she said. This month Nyree will also be the feature artist in the Aboriginal Legal Service's magazine, which will feature eight of her paintings, including one that will be printed on the cover. Nyree said she hopes to use her experiences to help promote the Blayney Shire as an art and culture friendly community. "One of the things I would like to do in the future is work with the council to paint welcome signs for the outskirts of town so we can welcome people to Wiradjuri country."